﻿﻿Generally installed on doors and windows reed switches are a reliable and effective way to secure and/or monitor the perimeter of your building. 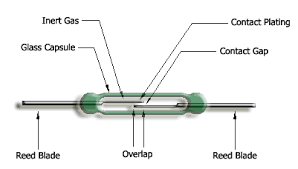 Based on a very simple design and with no need for complicated electronic circuitry, reed switches last an extremely long time and very rarely need replacing. Correctly installed, reed switches are virtually immune to false ﻿alarms. 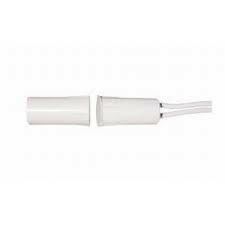 When connected to your alarm system a reed switch enables the alarm to monitor whether a door or window is open or closed. ﻿﻿﻿﻿﻿﻿Also known as a flush mount reed. 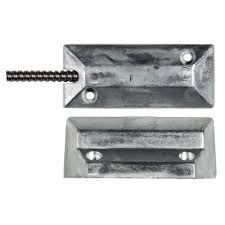 This device is inserted in to a window or door frame with an opposing magnet inserted into the edge of the window or door making them almost invisible. Generally installed on sliding doors and windows these switches are for use in situations where a pencil reed cannot be installed. 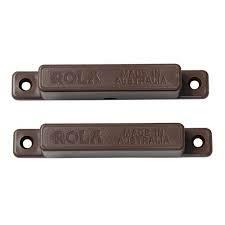 Roller door reed switches are basically a heavy duty version of a surface mount reed. With an armoured cable and a cast aluminium casing strong enough to drive a forklift over, these switches are ideal for monitoring roller doors in both domestic and commercial applications.